Sometimes, when you open Control Panel and try to start some of the program in its menu, there will be a pop-up box with an error message that sounds like: “Windows cannot find C:\Windows\Rundll32.exe make sure you typed the name correctly and try again”, or some close. The problem is a missing or corrupted Rundll32.exe file, and the more likely cause might be related to some malware program that infected your PC. Some of well-known security treats are Buy-internet-security2010.com hijacker, W32.Miroot.Worm, Backdoor.W32.Ranky, etc. The normal rundll32.exe process is responsible for running DLLs. It is responsible for placing libraries in the memory. 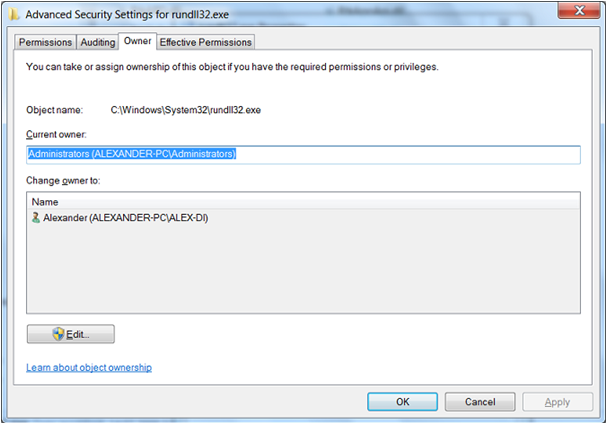 The rundll32.exe is a command line utility program that performs its embedded functions in addition to the rundll.exe file. Rundll32.exe invokes a function that is exported from a specific DLL module. The only DLLs that can be called with the rundll.exe and rundll32.exe files are the ones that are specified to be accessed by these processes. The rundll32.exe parses the command line. The specified DLL is then loaded by the function LoadLibrary(). After that, it gets the addresses from this function through GetProcAddress(). The command line tail is passed to the function when it is called. Then, the DLL is unloaded upon the return, and the rundll32.exe file exits. Rundll32.exe is a system process that is needed for Windows system to work properly. It should not be removed. The malicious process is registered as a backdoor vulnerability that may be installed by an attacker allowing access to the infected computer from remote locations, stealing passwords, personal data and Internet banking requisites. This is a security risk and should be removed from the system. In some cases the malicious rundll32.exe is just masked under this name and placed in the original location, but more often it hides in different directories and sometimes uses different close names such as rundII.exe or run32dll.exe. In the first case two capital letter “i”s are used instead of “l”s. So, you are not necessarily will get the mentioned above error message, and then it will be even harder to realize that the problem exists and someone might be stealing your private information. The first step is running a full scanning of your system with your antivirus software and maybe with some special scanning utilities that are designed to investigate for security holes in you system if they can work alone with the installed antivirus. The malicious process might be traced by these programs and deleted or placed to quarantine. Actually, the deletion of the malicious rundll32.exe by the antivirus might be a cause of the error message. In addition to running your antivirus, you can try to search for rundll32.exe and its malicious versions nicknames mentioned above. The genuine file is located in Windows\System32\rundll32.exe, and its size is somewhere close to 35 – 45 KB and depends on the Windows version used. If you find this file in different folders such as “My documents” or “Program files”, then delete it. If the size of file found in the original location is too big or too small, then the original rundll32.exe might be replaced by a malware. Try to start Control Panel and its services to test on the error message coming up. If there is one then you need to replace a malware file with the original rundll32.exe. Note: The original file can also be found at locations Windows\System32\dllcashe, Windows\SericePackFiles\i386 , and Windows\Winsxs\x86_microsoft_windows_rundll32_… depend on the Windows version. First try to restart your computer. I some cases it might be a sufficient remedy that will let the Windows fix the problem by itself. As an example, if the error had occur after the improperly plugged off USB device. Because some causes of the problem might be related to incorrect and outdated registry records, try to run some advanced registry cleaning program that will fix this kind of possible causes for the error.If you noticed that the problem occurs after you had installed some new software, then try to uninstall it and check if the error will go away. The problem also might be caused by some faulty device driver, and so, it is better to make the system update before you start to make any changes. If you already updated your system ran the antivirus and searched for possible files with wrong name aliases, and deleted them, then you need to replace the corrupted rundll32.exe in original location with the legal copy of this file. It isn’t that easy because Windows system is protected from the system program files replacement, especially Windows 7 and Vista. Even if you get a right copy of rundll32.exe from another PC or download it from the Internet, might be not able to replace the one in the folder System32. To replace rundll32.exe in Windows 7 and Vista, you need temporarily to switch off the mechanism of the system file protection. To do that, you need open Windows\System32 folder and right-click rundll32.exe file. 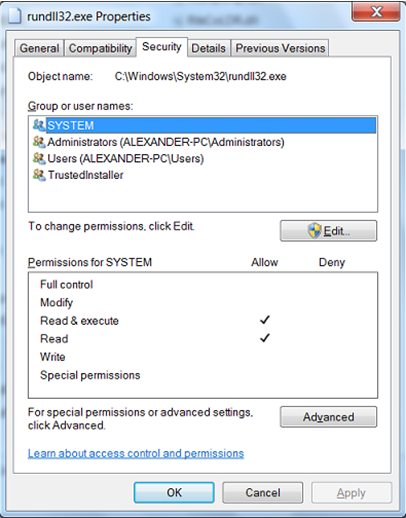 In the pop-up menu choose Properties and in the window that will come up open Security tab. Click Advanced button and in the opened window open Owner tab. Click on Edit button and highlight your session name in the list. Then, click OK button and say OK to the Windows Security message. This will change the file access for you and you can replace the file rundll32.exe with right one by hand. To replace this file in Windows 2000 or XP you can use a special utility program called “Replacer”. Download this program and the legal copy of rundll32.exe. Run the program and drag the legal EXE file with the mouse in the Replacer window. The program will make the replacement. You can try to install rundll32.exe from the installation CD. Pot the Windows XP CD-ROM disk in your CD drive. Type expand X:\i386\rundll32.ex_ C:\windows\system32\rundll32.exe in the Open box (X is the letter of your CD-ROM Drive). Also there is a way to find the right copy of rundll32.exe in Windows\System32\dllcache, or in Windows\SericePackFiles\i386 folders. I tried the method for Windows 7, but my pc still does not want to replace this file. I dont want to reinstall windows 7 because i have lots of important files on my hard drive. What do I do? please help me.